Kona Commons has free outdoor movies on the last Friday of every month! 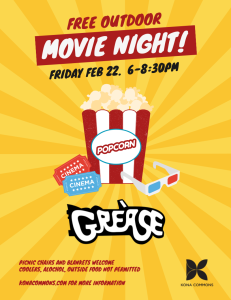 Bring the whole family, grab a bite to eat at one of Kona Commons’ restaurants, dine picnic style and enjoy the classic movie grease under the stars! Check konacommons.com for more information and future dates. See you at Kona Commons!